Delivered on Time or Your Money Back! Frontier Express Couriers provide an easy to use, responsive and flexible courier service that guarantees to deliver and meet the needs of today's busy professional. If you are looking for a friendly, local courier company to work with you and take the stress out of shipping then give us a call. Just one call to Frontier Express and we do the rest leaving you to get on with what really matters to you. From our base in the East Midlands, we offer a full range of courier services to clients in Derby, Burton, Loughborough and Nottingham. If you are looking for international, European or domestic deliveries we can deliver for you. And we offer a Full Money Back Guarantee on all of our Domestic Services. If we don’t delivery you don’t pay. It is a simple as that. If you are just browsing or looking for advice then our free download is just for you. 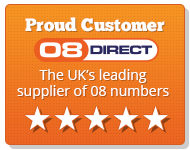 6 steps to a successful delivery gives you all the information you will need to make sure you get the right service for you. “Go Digital Print (Derby) Ltd has used Frontier Express for deliveries in this country and abroad for 4 years. We have never been let down by Frontier Express and would highly recommend their services to any company in the Derby area who are looking for an efficient & friendly service, backed by a worldwide delivery and collection network”.